Once in Cusco you are approx. 80km South-east of Machu Picchu, which you can reach either by joining an organised trek on the Inca Trail or one of the alternative trails to Machu Picchu; catching a train from Cusco or from Ollantaytambo in the Sacred Valley; or catching a minivan / bus from Cusco / Ollantaytambo to the town of Santa Maria, which is just north of Machu Picchu, and then continuing by foot or vehicle to Santa Teresa, and then onto Hidroelectrica. In this article – How to get to Machu Picchu – we explain each of these travel options in detail as well as provide the cost and planning considerations of each method of transport. The most popular trek to Machu Picchu is the Classic Inca Trail, which is a 4D/3N hike from the Sacred Valley all the way to Inti Punku, the Sun Gate and sacred entrance to Machu Picchu. The trek follows original Inca trails that sojourn through incredible cloud forests and high alpine landscapes, and pass by a number of impressive Inca ruins. 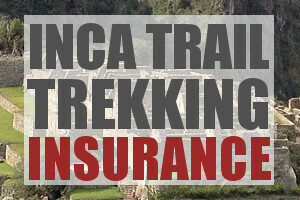 Due to it’s popularity and archeological significance, the Inca Trail is highly regulated. Only Peruvian companies with specific trekking licenses can operate the trek and hiking permits are limited to 500 trekkers per day (300 of which are used by guides and porters). For this reason if you plan to trek to Machu Picchu via the Inca Trail you will need to book well in advance. We recommend securing a trekking date at least 6 months before your departure from your home country, particularly if you plan to visit during the peak dry season of May-September. To read about the Classic Inca Trail and it variants – the Short Inca Trail and Salkantay / Inca Trail Combo – please check out our detailed route and itinerary guide here. There are also a number of fantastic alternative treks to Machu Picchu, which are quieter than the Classic Inca Trail and do not require permits. Early booking is still recommended during the dry peak season (May-Sept). For footloose backpackers it is possible to book an alternative trek to Machu Picchu from Cusco a few days in advance, but this may mean you need to take the long bus route back to Cusco after visiting Machu Picchu, as return train tickets may have sold out (more on this in the section Santa Maria – Santa Teresa – Hidroelectrica below). All the alternative treks end at Aguas Calientes, the town below Machu Picchu. Trekkers typically sleep the night in a hotel and rise early the next morning to catch a bus from Aguas Calientes up to Machu Picchu. It is possible to hike up to Machu Picchu (be prepared for a 90 minute slog up 2,000 steps). For detailed route and itinerary guides on the alternative treks to Machu Picchu we recommend you read our Machu Picchu Trails and Routes overview article here, or visit the individual trail guides: Salkantay Trek, Lares Trek, Choquequirao Trek, Vilcabamba Trek, Inca Jungle Trek and Huchuy Qosco Trek. 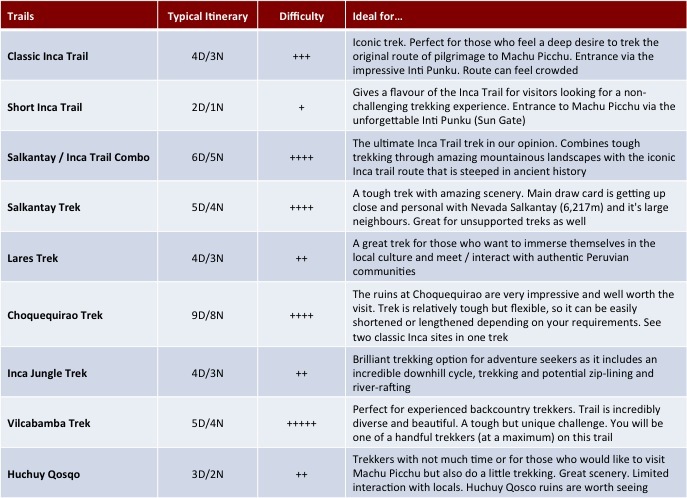 The table below might help you decide which trek is best for you. It is important that you book your train tickets as early as possible (ideally book your train tickets before you book your flights) as securing a seat can be tricky. Do not arrive in Cusco with a plan to book your tickets there as you will most likely be very disappointed! 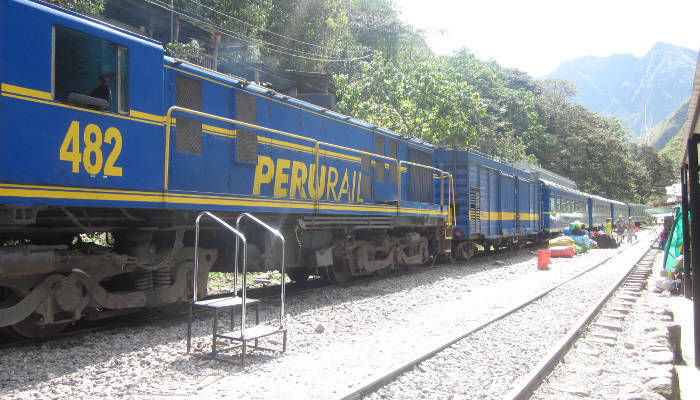 Peru Rail operate three services to Machu Picchu, which depart from either Cusco (~3 hours to Machu Picchu) Urabamba (just the Vistadome) or Ollantaytambo (~1.5 hours to Machu Picchu). Train tickets can be bought on their website, at their office in Cusco, in Lima (Lacomar Shopping centre in Miraflores) or at the airport. Here are their three services, ordered from most affordable to luxury. The Expedition service is the most affordable ticket (bar the service that is run just for Peruvians). The seats are comfortable in this service and arranged so that 2 seats always face each other. The service has air-conditioning and the ceiling is partially glassed to provide better views of the scenery. The service also includes a small snack and drink. A one-way ticket from Cusco to Machu Picchu costs ~US$65-75 (2014/2015). Click here for timetables and prices. The Vistadome, as the name suggests, is a service which has carriages that maximise the views of the Sacred Valley. 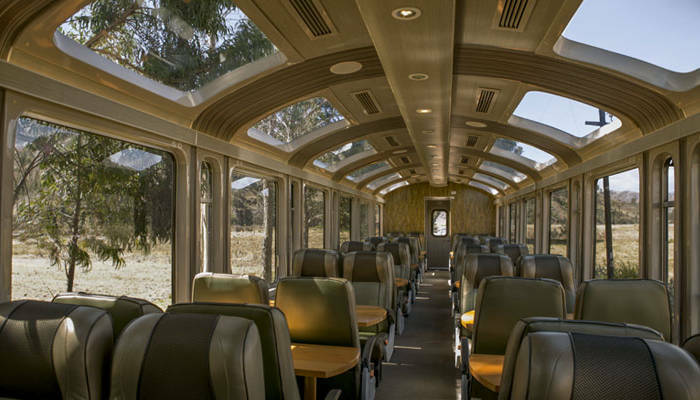 The carriage windows are larger than the Expedition train, and the service a little more luxury. The seats are made from comfortable leather and a better snack is served than that provided on the Expedition. On the return journey you will also be treated to some entertainment from traditional Andean dancers. A one-way ticket from Cusco to Machu Picchu costs ~US$85-95 (2014/2015). Click here for timetables and prices. The Belmond Hiram Bingham is for those who want to travel in serious style. The service has won a number of accolades, including being selected as the best train in the world by the readers of Condé Nast Traveller UK in 2011, and voted by NBC as one of the 10 most wonderful train journeys in the World. This service has four dark racing blue wagons and carries 84 passengers in total. Two of the wagons are for dining, and there is an observation wagon with bar. 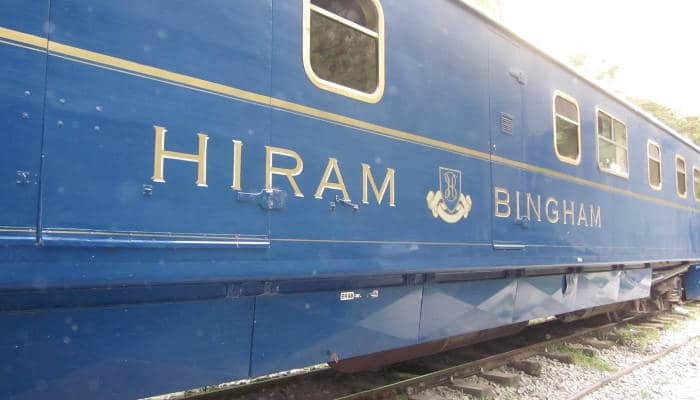 You can find out more about the Belmond Hiram Bingham here. Inca Rail operate trains from Ollantaytambo only. To get from Cusco to Ollantaytambo you can either catch a 1.5-hour taxi (~US$40) or minivan (~US$5), or a 2.5 hour bus (a few dollars). The best minivans are run by Colectivo and can be caught at Paradero Pavitos. 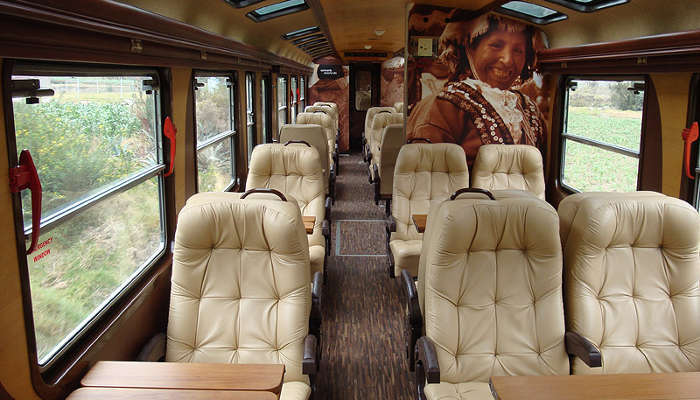 There are four Inca Rail services – Machu Picchu (Economy), Executive Class, First Class and Presidential Class. Tickets can be booked on their website, in their Cusco office or at the airport. The train runs three times a day to and from Ollantaytambo-Machu Picchu. Tickets cost ~US$60-US$65 one way. More details on the schedule and booking can be found here. 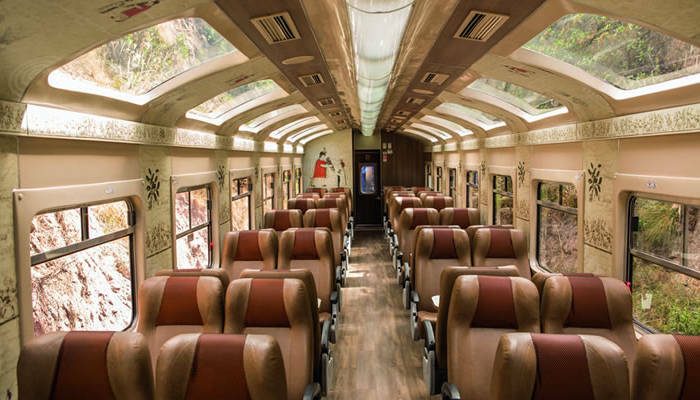 This Inca Rail train is split into three services – Executive, First and Presidential Class – and runs three times daily. Prices range from US$60 for a one-way ticket in the Executive Class, up to US$200 in the First Class, with the key differences being in carriage design, comfort, service and food. The Presidential Class is a chartered carriage that needs to be booked by a group and is priced on application. Read more about each service level here, and check out availability. If you don’t manage to book a train ticket or if you are on a budget, don’t fret, you can still get to Machu Picchu using the Santa Maria – Santa Teresa – Hidroelectrica Station Route. 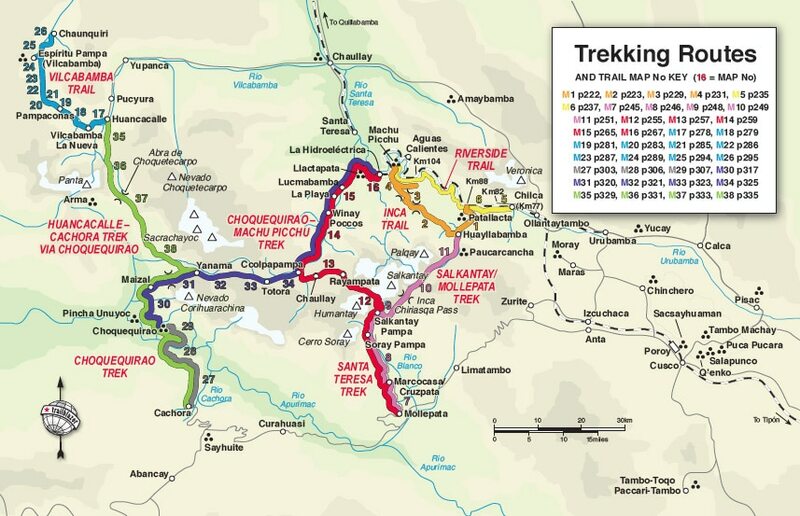 This is a long and tiresome route, but is a lot cheaper and can be incorporated into a mini-expedition! Santa Maria is a small town north of Machu Picchu that is connected to Cusco and Ollantaytambo by road (see trekking map below to get your bearings, Santa Maria is near Chaullay). From Cusco the trip to Santa Maria takes 4 hours by minivan (US$10-US$15 pp) or 5 hours by bus (~$US5). From Santa Maria you can either trek to Santa Teresa, a 12km hike (6-7 hours hiking), or catch public transport, which takes about 1.5 hours. Santa Maria and many areas around it, all the way north to Quillabamba, were severely impacted by landslides in 1998. This means that infrastructure in the area has been set back a lot. Please Note: Landslides are an annual risk every year during the wet season (Nov-April), which can make this route inaccessible. From Santa Teresa you can either continue by public transport to Hidroelectirca Station (~40minutes) or hike for 3 hours. Hidroelectica Station is where the trains from Cusco / Ollantaytambo terminate. You can either catch a 45-minute train from Hidroelectrica to Aguas Calientes (~US$25) or trek a further 2.5 hours to the town. We recommend overnighting in Aguas Calientes. In short, if you leave Cusco at 07:00, you should arrive in Santa Maria by 11:00. Another private car to Hydroelectric will get you there by 14:00, and then you can trek the final route to arrive at Aguas Calientes by 17:00. A long day but one that will only set you back $US20-$US$30 one way. There are two ways to get to Machu Picchu from Aguas Calientes – either trek for 90 minutes up some steep steps or catch a bus. No prizes to guess which option most people choose. 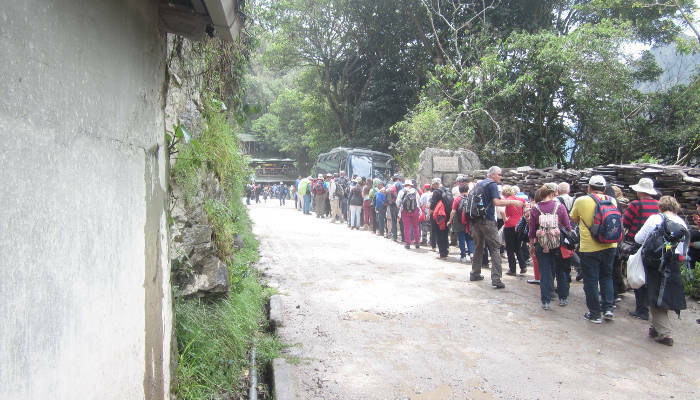 Buses from Aguas Calientes run every 10-15 minutes from 05:30am, and during the peak trekking season queues can form as early as 05:00am. You catch the bus near Plazaa Principal in Aguas Calientes. The bus trip takes 30 minutes up the switchback road (aka Hiram Bingham Highway) to the official tourist entrance to Machu Picchu. A return ticket currently costs ~US$20 (~US$10 for a one way) and can be bought in Aguas Calientes or at Machu Picchu, if you just need a one way ticket back. Okay, so now that you know how to get to Machu Picchu, the final thing you need to prepare are your tickets to Machu Picchu. You cannot arrive at Machu Picchu and expect to buy tickets at the entrance gate! You need to book your entrance tickets to Machu Picchu in advance. You can book your Machu Picchu tickets through the government website – http://www.machupicchu.gob.pe/, or from the Instituto Nacional de Cultura (INC) in Cusco or Aguas Calientes’ Cultural Centre at the Plazaa Principal. Hotels, travel agents, hostels and other third parties also sell tickets but we recommend sticking to the first three official ticketing options. Tickets cost ~US45 for entrance to Machu Picchu and are limited to 2,500 available tickets a day. Half price discounts are available to Peruvian nationals or students with a valid ISIC card. If you wish to climb Huayna Picchu or Machu Picchu Mountain you will need to pay an additional ~US$15, and tickets are limited to 400 permits and two available climbing times (07:00 or 10:00). Find out more about these climbing options here. Please note: you need to provide your passport number to secure an entrance ticket to Machu Picchu. Tickets are non-refundable and non-transferable. You well need to have your passport on you to be granted entrance to the Citadel! DO NOT FORGET YOUR PASSPORT. Tickets are only valid for one day, so if you would like to visit the ruins twice, you will need to purchase two tickets. Along with your passport, please also remember to bring insect repellant, water, a rain jacket (you never know), and some spare soles (you have to pay to use the toilet). Feel free to ask any questions in the comments below and we will respond within 24hours (so check back). If you found this article useful please share on your social network, or better yet, if you have a blog that is tracing your journey to Machu Picchu, please link to us! Can you send me the actual schedule of the trains between la Hidroelectrica and Aguas Calientes and vice-versa? Do the foreigners can take any of those trains? Thank you. Hi, this is all great information. I just have a question about the minivan from Ollantaytambo to MP. I am flying into Cusco and plan on going right to Ollantaytambo to take the train from there. I saw that you catch the minivan from Paradero Pavitos, but I am just wondering how far that is from the airport and will I need to take a taxi to get there or do they also have collective minivans from the airport. Thanks for you help. Hi Kim, I believe the only way to get to Ollantaytambo from Cusco airport is by taxi (could be wrong, though). If you are aready in Cusco centre (i.e. the main square called Plaza de Armas) then you can take a 15 minute walk to Avenida Grau (5 minutes by taxi). From here you can get a shared colectivo which leave every 20–30 minutes for Ollantaytambo. A colectivo is a minivan or small bus where passengers share the cost of the journey. There are no scheduled times for collectivos, they simply wait until full before heading off. The journey from Cusco to Ollantaytambo takes around about 1h 45 minutes, and costs 10–15 Soles per person. Im a little confuse due.. I want to travel to machu picho and spend like a week in cusco and around. 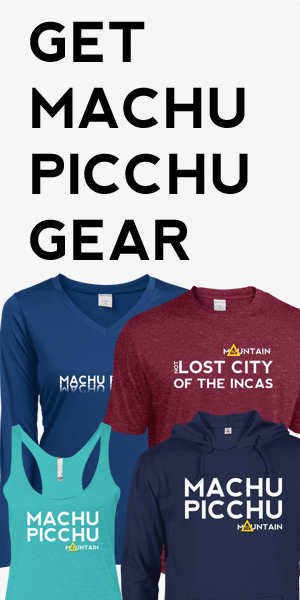 what do you think will be the best way for me to get to machu picho? Hi Adar, you can either trek to Machu Picchu on one of the many trails that lead to Aguas Calientes – see: https://www.machupicchutrek.net/hike-to-machu-picchu/ or you can catch a train to Machu Picchu from Cuzco or Ollantaytambo. Hope this helps! Hi Marzena, Thanks for your question. Unfortunately I don’t know the answer. Your best bet might be to check in Cuzco before you leave for Machu Picchu. All the best! I understood that a bridge was flooded away in Santa Teresa. I would like to use the Santa Teresa route to MP. Is this possible in september? And what about the rain in this period? Thanks, your description is very helpful. Hi Marianne, September is a good time to trek – probability of heavy rain is low. I believe the Santa Theresa trek is open. Hi. We’re planning to head back to Cusco after MP via Ollantaytambo the same day. We arrive in Ollanta at 8PM. Will there still be a collectivo by then? Or how safe is a taxi from Ollanta to Cusco? Thanks! Taxi’s are generally safe, but the cost for 2 people can be pretty hefty. There are buses or min-vans where you can partner up with other travellers to get back to Cusco. Hope this helps! Planning on doing 1 day at Machu Picchu. We will take the early train from Ollantaytambo and spend the day there, then take the train to Cuzco. Was wondering about the train back from MP to Cuzco. Is it necessary to book this in advance, or can you show up at the train station in Aguas Calientes and buy your ticket same day? Hi Mychael, I would recommend buying your return ticket in advance. It can be very busy so to avoid disappointment I would book in advance. I understand I must provide my passport number to buy tickets for MP. The # I have now will not be the # when I arrive to Peru (updating USA passport now). Will this be a problem at the MP entry? Hi Leezer, I would take your old passport just in case. Generally they check if the name matches, but it would be prudent to have your old passport with you if you can. Cheers! If I decide to do the three 3nights and four days, where can I store my other belongings? And do I need to have all camping gears with me? I’m coming in from California. Hi Cindy, you can store your belongings at your hotel in Cuzco. All the best! My partner and I are travelling SA for 3 months and Machu Picchu is my number 1 thing to do, however we aren’t entirely sure when we will get there on our travels. Is there any way of getting a flexible ticket as I don’t want to book it to find we won’t get there on time! Hi Kim, if you are planning to take the train from Cuzco or Ollantaytambo then you can book a few days in advance, sometimes you can even get tickets on the day but I wouldn’t leave it till that late. All the best. Hi! How do you recommend is the cheapest way to get back to Cuzco after touring Machu Picchu? Hi Mari, Train is the cheapest way back to Cusco. We are going to stay in Cusco for few days and we were planning to get to Hidroelectrica by colectivo and from there hike to Aguas Calientes. Spend the night there and then climb to MP. It seems the cheapest option (only pay colectivo from Cusco to Hidroelectrica and one night in AC). How do we get back? Same way? Can it be done on the same day we visit Machu Picchu? Meaning we would get up very early, climb up, spend the day visiting MP, climb down to AC, hike to Hidroelectrica and catch a colectivo to Cusco all in the same day? Or do you recommend spend another night in AC? Hi Monica, the best way to get back to Cusco from Machu Picchu is to catch a train back to Ollantaytambo from Aguas Calientes and then get a minibus / taxi back to Cusco. If you leave Machu Picchu at around 15:00, this will give you enough time to catch the train in Aguas Calientes. The bus from Machu Picchu to Aguas Calientes takes about 15 minutes, but there is often a queue in the afternoon to collect a bus at Machu Picchu. If you are looking for a budget option then getting a minibus from the Hidroelectrica is also an option. There are two ways to get back to the Hidroelectrica. 1. Hike from Machu Picchu / Aguas Calientes back to the Hidroelectrica (from AG this is about an 1-1.5 hour hike, from MP it is about 1.5-2 hours). 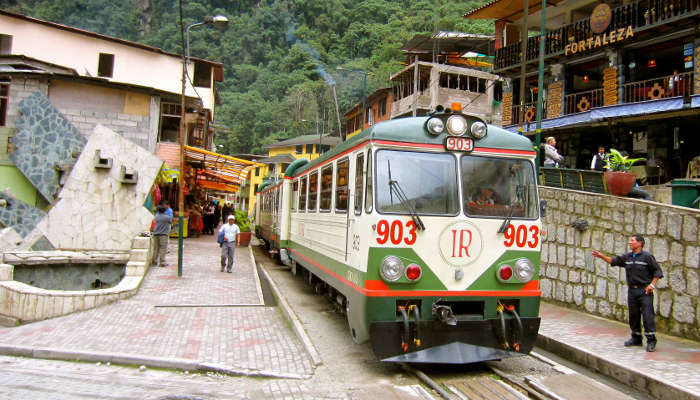 or 2. you can take a train from Aguas Calientes to Hidroelectrica (this is about 15 minute train ride – I don’t know the current cost). 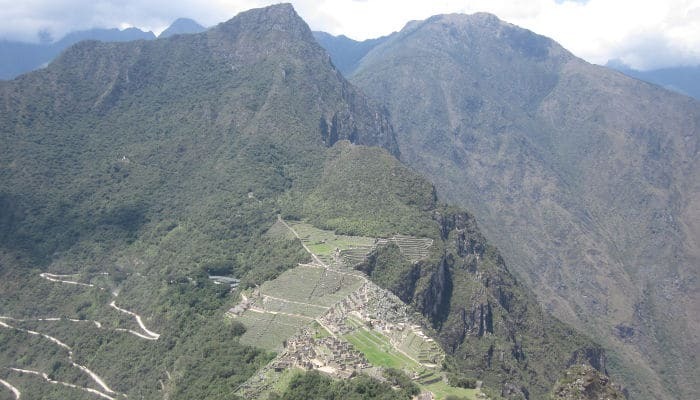 Either way it is possible to visit Machu Picchu from Aguas Calientes and get back to Cusco on the same day. Hope this helps! Thank you so much for this helpful information. I had a question regarding the trains. We will be staying in Cusco. Does the Peru Rail train (from Cusco) go all the way to Machu Picchu, or does it only go to Aguas Calientes where we will need to take the bus? Also is the $65-75 train price round-trip or one-way? Thanks for your help! Hi Charlotte, the train goes to Aguas Calientes, the town below Machu Picchu. From here you can hike up to Machu Picchu or get a bus. 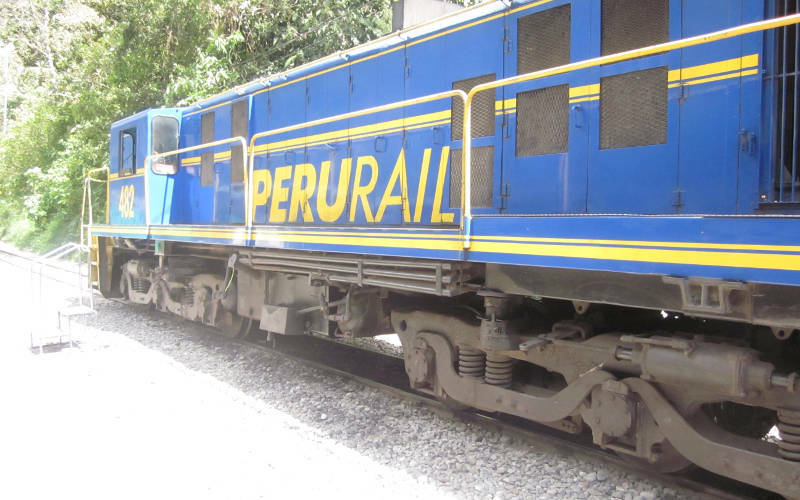 Train ticket prices may have changed, I recommend checking our Peru Rail or Inca Rail for updated prices. Hope this helps! Hi Elaine, yes you can get a train from Ollantaytambo to Hydroelectrica and then walk to Aguas Calientes. The walk is about 1-2 hours, depending on how fast you go. Just follow the rail tracks. All the best! Hi, we are a family of 4, 2 sons who will be hiking up the most popular inca trail to MP with United Mice. My husband and I will be taking the train. We are thinking to go to Ollay immediately after we arrive in Cusco. Is this a good idea? How and when will we meet up and how do we return to Cusco together? Thank you. Hi Jane, yes, going immediately to Ollantaytambo is not a bad idea as it’s about 1000m below Cusco. You can meet up with your sons in Aguas Calientes. There is a train from Ollantaytambo to Aguas Calientes. You can then return together by train to Cusco. All the best!